Welcome to our Roman Numeral Translation Calculator. This calculator will convert from Roman numerals to the decimal (base-10) number system or from the decimal number system into Roman numerals. Here is our Roman numeral translation calculator which will help you to convert roman numerals to decimal and decimal to roman numerals. Our roman numeral translation calculator will also show you the formula and working out you need to convert between the two systems. This convert will convert numbers up to six digits into Roman numerals. There are just 7 Roman numerals: I, V, X, L, C, D and M.
Unlike most other number systems, the numerals can only be used in particular sequences. Another rule is that apart from M, you can only have a maximum of 3 of any given numeral in a row. Here is a quick overview of the 7 Roman numerals and what each is worth. So XLMM would represent 42,000. This quick conversion table shows you some common roman number to decimal number conversions. We have some more detailed Roman Numeral Lists, including printable sets below. To convert a Roman number to the decimal (base-10) number system, we need to group the Roman numerals into their values and then add them together. One thing to remember when doing Roman numeral translation is that the Roman numbers usually go from bigger to smaller. However, if a smaller value Roman numeral (I, X or C) comes before a larger value then it is subtracted from the larger numeral. But if a smaller value numeral comes BEFORE a larger value numeral it is SUBTRACTED! An example is that C has the value 100 and X has the value 10. XC is worth 100 - 10 = 90 because the X comes before the C.
Example 1) What is XXIV as a number? Step 1) Split up the Roman numerals into their values. The IV has been written as one value because the I comes before the larger value V.
Step 2) Write down the values of each part. Step 3) Add them up. So XXIV is equal to 24 as a number. Example 2) Write CDLXXVI as a number. The CD has been written as one value because C (100) comes before the larger value D (500). So CDLXXVI is equal to 476 as a number. Example 3) Write MCMXLVIII as a number. So MCMXLVIII is equal to 1948 as a number. To convert a decimal number (base-10) to the Roman number system, we need to change the decimal base-10 place value into Roman numerals representing their values. The chart above can help to do this, or you can try your own worked examples below, on our Roman Numeral Translation calculator above. Example 1) Convert 64 into Roman numerals. Step 1) Look at what place values we have. Step 2) Write each place value as Roman numerals. Step 3) Put the numerals together. So 64 is equal to LXIV in Roman numerals. Example 2) Convert 397 into Roman numerals. So 397 is equal to CCCXCVII in Roman numerals. Example 3) Convert 3489 into Roman numerals. So 3489 is equal to MMMCDLXXXIX in Roman numerals. Our Roman Numeral lists can help you to quickly convert different numbers from Roman numerals to numbers. The lists can also help you to spot patterns and understand how Roman numerals work. We have a wide range of lists to help you with your Roman numeral conversion. 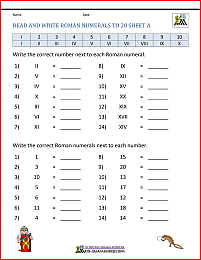 We also have a collection of Roman numerals worksheets for helping to learn how to convert from Roman numerals to numbers. Our worksheets cater for a range of abilites and have differing levels of support.